WHAT A roundtable workshop bringing together school administrators, educators, parents, and students from a variety of communities to gather input on school safety. 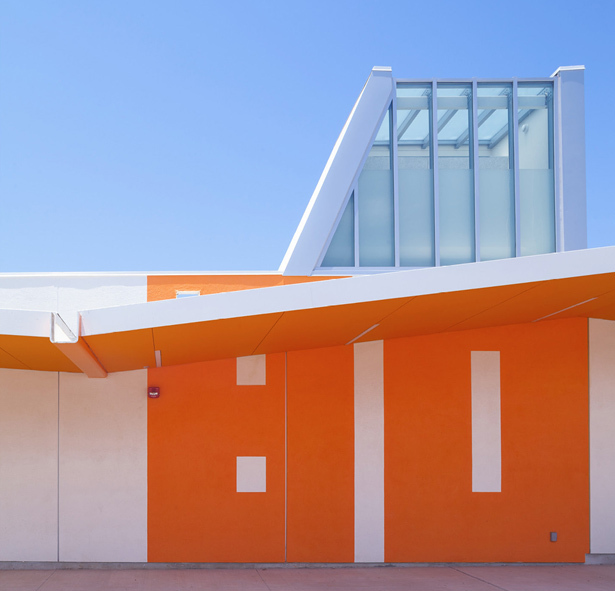 The workshop follows the AIA LA Designing Safer Schools discussion from August 23.
WHO Santa Monica Malibu USD administrators will start the workshop with a presentation about the district’s new security pilot projects. 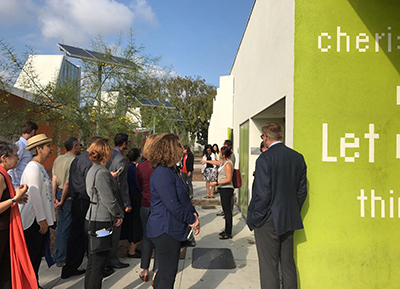 Moderators will include AIA Los Angeles, the Association for Learning Environments, and local architecture firms. 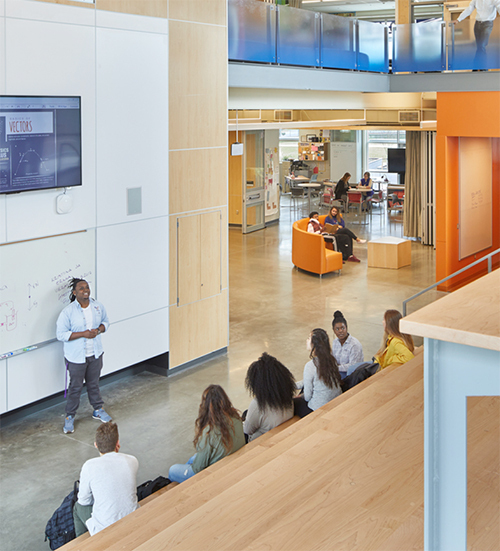 WHY Input from the workshop will guide recommendations on school safety, showing how school environments for contemporary education can be developed to reduce the incidence of crime and daily threats. These recommendations will be submitted to the AIA at the national level and to governmental organizations to guide future policy. Steps to prevent and to prepare for both daily threats and emergencies. Measures both to increase the perception of safety and to make the physical environment safer. How would a trauma informed school improve safety? 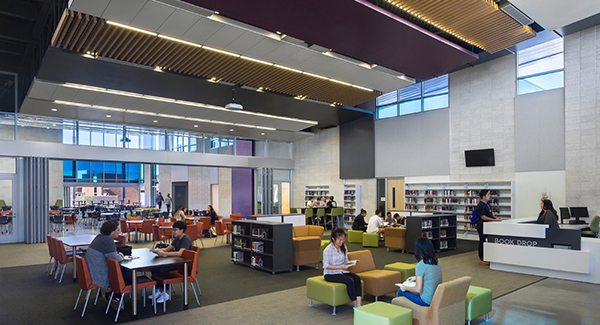 What physical and cultural shifts are needed to make a school welcoming yet safer? How do we manage the check-in and pick up challenge? What can you imagine doing (physical and programmatic) that engages all community members? Pizza dinner courtesy of Erickson Hall and Vanir at 6:00 pm to continue the conversations and wait out traffic. For an invitation once the date is set, sign up now or send your email to Mariana Lavezzo at mlavezzo@dlrgroup.com. 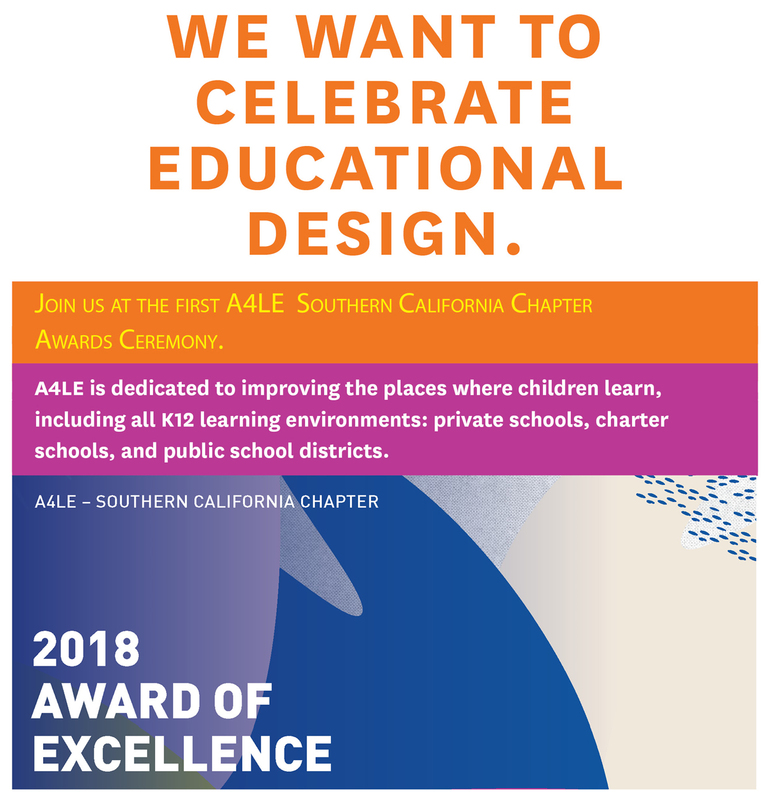 The Southern California Chapter invites you to a Design Tour of a Dynamic Learning Environment demonstrating Innovative & Collaborative Spaces. 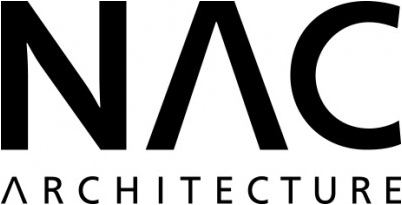 Please RSVP to Tina Frank at tfrank@nacarchitecture.com by October 3, 2018. 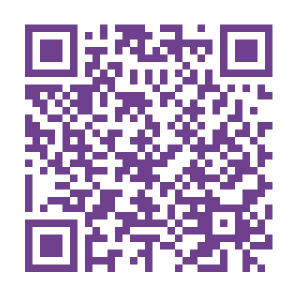 Join us for another Southern California Chapter event focused on technology presented by Vantage Technology. Please RSVP to Tina Frank at tfrank@nacarchitecture.com by August 31, 2018. 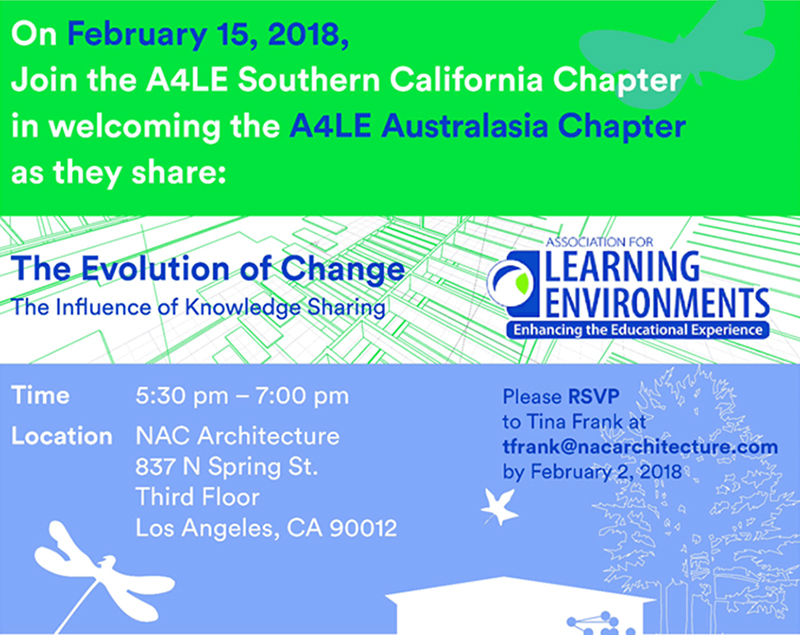 Join the Southern California Chapter in welcoming the Australasia Chapter as they share: The Evolution of Change – The Influence of Knowledge Sharing. 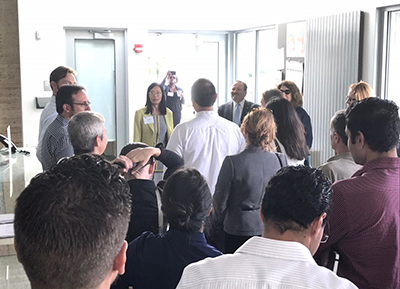 This magnet campus combines the community-selected pathways of biotechnology and medical science with work-based learning. 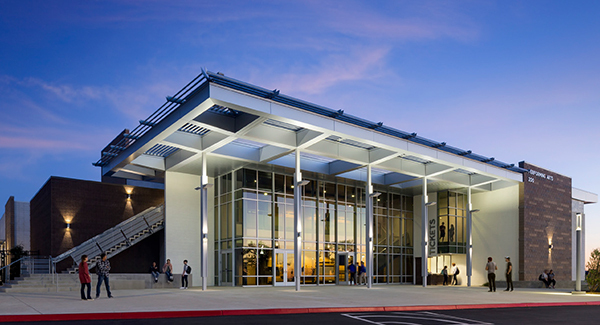 Earning a Del Lago Academy diploma will mean a student scholar, innovator, and world citizen is college AND career ready. 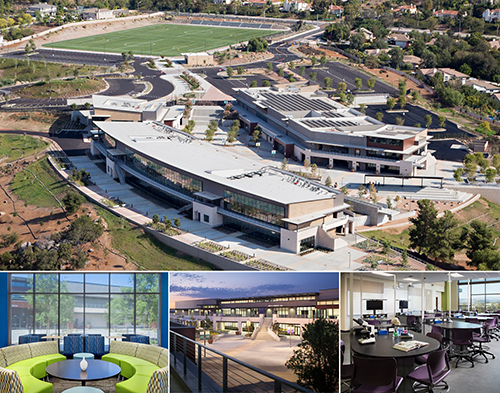 The campus combines environmentally sensitive design with sustainable features and progressive, collaborative learning environments. Transportation: We have a bus to charter attendees to the tour. 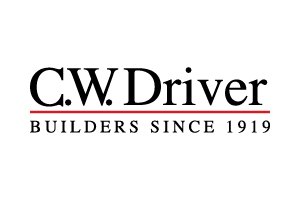 The bus will be picking up the attendees at The Duke Hotel Newport Beach (formerly the Fairmont), located at 4500 MacArthur Blvd in Newport Beach, CA 92660 where the CASH Fall Conference is being held. A box lunch will be provided to all attendees. 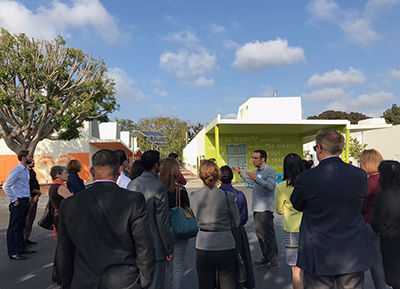 Join us for the first Southern California Chapter event with the USGBC LA Green School Committee: the John Adams Middle School (JAMS) Tour and Drinks in Santa Monica. After the tour, skip the traffic and grab a drink with us around the corner. The first drink is on us! Please RSVP to Tina Frank at tfrank@nacarchitecture.com. Parking at the adjacent Will Rogers Learning Community. 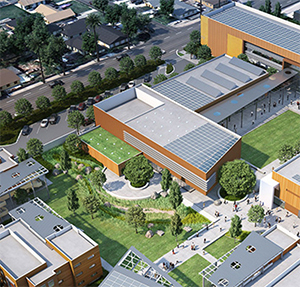 Sponsored by Erickson Hall, RMA Group, NAC Architecture, and USGBC LA Green School Committee. Southern California chapter's first event was a great success with over 30 people in attendance!